Bhuhari means daughter in law in Nepali. As per our plan, I have booked my flight to go to Kathmandu, Nepal for mid of December. 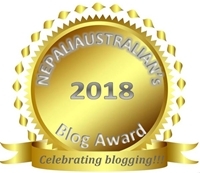 I know I have been back form my Europe trip not long ago and l haven’t finished blogging about places we visited in Europe but it has been more than a year since we went to Nepal so, it is a perfect time to go again. We will be using our Christmas and New Year break with our annual leave to accommodate this holiday. We will be going via Bangkok and will be stopping over for 4 days to do some sightseeing , some shopping and meeting AS’s family . We had been to Thailand before but I will be really nice to go again and meet AS’s new niece. She is so cute. While in Nepali, my nephew will have his Pasni ceremony as well so we have a celebration and a holiday with our family. My brother, sister in law and nephew will be travelling there before us. I always like to book my holiday in advance so I can look forward to the day and that keeps me going. I am always very eager to go to Nepal and I am this time as well but I have some fear of all the changes I will face. This time, going to Nepal will be very different for me than ever before. This will be first time for me to go to my home town as a Bhuhari. It may sound strange in western society but life after marriage for Nepali women is very different than here. Lots of things do change which I haven’t really felt because I am in Australia but that will affect me while I am in Nepal. Every time, I go to Kathmandu, my parents would come to pick me up at the airport but I am not sure what will happen this time. Because I am meant to go to AS’s house (my new home) from the airport. I am thinking to tell my parents not to come to the airport to receive me as I don’t want them to go home without me but instead am planning to go and visit there on the same day in the evening. I will have to divide my time between two houses this time and I have no idea how I can manage that easily. Going to Nepal always meant waking up late, not exercising , being spoilt my parents with yummy food , going out and meeting my friends and relatives, a short break to somewhere with my parents and lots of relaxation. But I am not too sure I can keep this attitude in my new home. I think it will be very rude to wake up at 8 am and go to kitchen where my MIL will be preparing breakfast for everyone. We have help but still she likes to do lot of things herself. Don’t get me wrong, as I have mentioned before as well, my MIL is very understanding and caring lady but still I can’t be spoilt the way my mum makes me when I am with her. I am not too sure how I need to plan my days as there are lots of pending invitation we need to attend this time form AS families’ side. As it is a culture in Nepal to invite newlyweds for dinner after their wedding, we got lot of those invitations after our wedding last year. But as we had only 4 days after the wedding, we declined them and told everyone that we will be visiting them next time when we come back to Kathmandu. That means most of our evenings we’ll be dining out either at AS’s relatives’ house or mine’s. Even in terms of clothing, I don’t know what I will be expected to wear. Like I mentioned in my post before, married women in Nepal dress differently after their wedding. So I am sure I can’t dress however I want. I don’t really mind wearing Sari and Kurta while I am there but it will be mid-winter so I am not too sure how easy it is going to be. Even a year after the wedding I will be a newlywed buhari so I need to learn all the right manners :). This entry was posted in Nepal, Personal, Social Issue and tagged europe trip, home, life after marriage, lifestyle, nepali women, Wedding. Bookmark the permalink. Sounds like fascinating times ahead! Congrats on your first trip back as a newly married woman. How interesting that clothes and expectations are different of women pre and post marriage, very curious. I hope you figure out what to wear mid winter! Very interesting to read of your life. Cheers. Oh going to your new home eh. I’m sure you will do great and they’ll be accommodating as well. WELCOME HOME IN ADVANCE . 🙂 and i am sure you will have blast amidst the busy schedule after arriving here. Unconditional love of both families, care will be bestowed upon you because your new family members will try to make most of your arrival after your wedding. Trust me, you dont need to be confused, you will feel you are newly weds with all the curiosity of families to meet you. take care. Thank you Shilu. I am looking forward to coming to Nepal 🙂 . I guess I am not a kid any more so have to take responsibilities now on . But coming to Nepal is always a blessing.